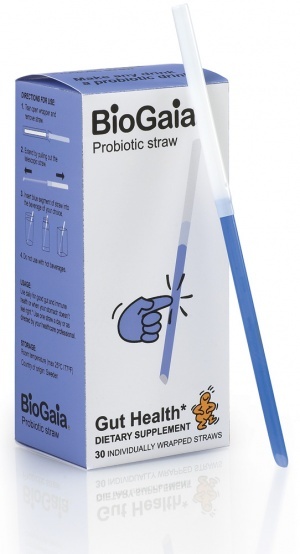 BioGaia Probiotic straw contain Lactobacillus reuteri Protectis, a natural lactobacillus that helps the good microorganisms restore a natural balance in the gut. L. reuteri Protectis naturally colonizes humans it has a strong adaptation to persist and interact with humans. L. reuteri Protectis has been tested in a number of clinical studies and proven effective as well as totally safe for both adults and children. Use regular for good gut health and when your stomach doesn’t feel right. Use at least one straw a day. Higher doses completely safe. Tear open wrapper and remove straw. Extend by pulling gout the telescoopic straw. Insert blue segment of straw into the beverage package.